FCC Universal Licensing System Intel at Your Fingertips! Join this industry's leading companies -- and likely your toughest competitors -- and add Premier Reporting Services to your EWA membership. You'll enhance your competitive edge, build stronger business relationships and provide higher levels of service to your customers. 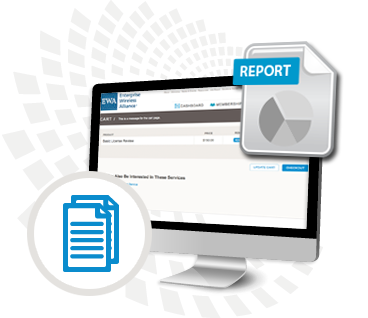 Premier Reporting provides the market intel that immediately pays off in increased sales and improved customer service. Premier members report it as an investment that can pay off in a matter of weeks in sales and savings, in staff time, on research and reporting. Ask EWA to build a customized reporting package with services you need from the list below or you can bundle them all together for $1,005/year – a great value for EWA members! Order below, or contact EWA Membership Services to learn more about how Premier Reporting can help you and your customers today! Get a discounted price by bundling the Exclusive Frequency Availability and the Market Area Reports together. EWA members pay just $1,005 in addition to their membership dues. The bundle is worth a bundle! Monthly analysis identifying the availability of exclusive UHF, VHF ( not including T-Band), 800 MHz, or 900 MHz channels on three specific sites of your choice. EWA will file your application with the FCC to secure any of the identified exclusive channels upon request. What is the value of an exclusive channel to your business? Monitor your competition and jump on sales opportunities. Site-based weekly band-by-band report of all licensing activity within a 161 km (100 mi) radius of a sales area you define. Increase your sales and customer base by staying informed of any new licensing activity filed to the FCC in the frequency bands that are most widely used by Land Mobile radio licensees.